A new purpose-built psychiatric intensive care unit has opened in Lincoln. Lincolnshire Partnership NHS Foundation Trust said the unit will allow patients to be treated while maintaining links with friends and family. The trust said being treated locally was "key to patient recovery". 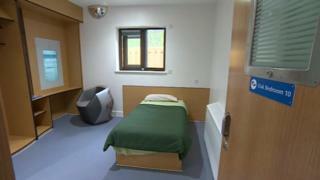 The 10-bed male-only unit, which is the first of its kind in Lincolnshire, has been built on the St George's Hospital site. Chief Executive Dr John Brewin said: "If you're experiencing serious mental health problems, being away from your family network is far from ideal. "We want our patients to remain as close to home as possible during their recovery." He added discussions would continue with commissioners on how a similar service for women could be provided in the county. What is a psychiatric intensive care unit?